Dan wasn’t very successful in the sales part, and by 1978 decided to pursue writing, by starting DAN’S FISH ‘N’ TALES® as a column in a small weekly newspaper. It eventually grew to an award winning magazine column. After being a guest on Virgil’s CHAMPIONSHIP FISHING SHOW, in 1984, the electronic media bug bit. Dan started hosting fishing segments for other outdoor shows and local newscasts. This lead to the award winning DAN’S FISH ‘N’ TALES® portion of WQPT’s LIFE & TIMES (PBS). At the same time Galusha was hosting the radio version of DAN’S FISH ‘N’ TALES, which won five media awards. So far, Galusha feels his top television achievement is the production and hosting of the PBS documentary, THE WORLD OF VIRGIL WARD. This show captured him another AGLOW Crafts Award. Dan used his communications skills to help form Bass Wranglers, Inc., which was a family oriented bass tournament group. He also successfully competed in the events, placing in the top five year-end champions each year. Seminars are another outlet, either as a solo or with fellow Bassin’ USA Pro Staff member, Johnnie Crain. As for actual fishing awards – at this time he has 152 state fish awards, 16 World Records, 5 World Angling Achievements, 6 Midwest Outdoors Readers Choice Awards and 2 Ozark Mountain Region fishing awards. He is only one qualifying fish away from being an Arkansas Master Angler. By the way, the majority of the awards, and all of the bass, are in the catch-and-release category. Dan hopes to work on a new DAN’S FISH ‘N’ TALES® television series, that will entertain and teach in a manner which will encourage beginners to become interested in the sport of fishing. He also wants to find a new outlet for his radio program. Some of Dan’s TV shows can be viewed on his YouTube channel, including the show he filmed with Virgil in 1984 on Bull Shoals Lake in Arkansas, the first place winner in the 2008 AGLOW Awards regarding fishing with mulberries, and a clip from The World of Virgil Ward, which is a short interview with Virgil on how he won the World Fishing Championship in 1963. Bass fishing information about largemouth bass, smallmouth bass, tournament bass fishing, fishing tackle and equipment, and fishing destinations, reports, guides, techniques, magazines and books and a whole lot more. Manufacturer of Tru Turn, XPoint and Daiichi hooks. Manufacturer of flasher and LCD depthfinders, and underwater cameras. Manufacturer of Jiffy Power and Hand Ice Drills. net, livewell net, live bait containers, and protable ice shelters. Manufacturer of Pulse-R Paddle Tail; Maxi Ring Worm; 4″ Ringworm; Super Doo; Paddle Tail; K-Grub; H2O Precision Jig Head; and other jigs and soft plastics. Nominated by Ron Stallings of TTI-Blakemore for the Fresh Water Fishing Hall of Fame, and notified of Induction into the Hall of Fame as a “Legendary Communicator” for 2012. Started writing for Iowa Sportsman. Started writing and uploading articles for Navionics apps. The new official Dan’s Fish ‘N’ Tales® website was published on April 20th at www.dansfishntales.com. The Dan’s Fish ‘N’ Tales® You Tube channel starts broadcasting with Fish ‘N’ Tales, one episode of Championship Fishing with Virgil Ward, and an interview segment with Virgil from The World of Virgil Ward Documentary. Caught a 48 pound flathead catfish on a Sebile FlatShad, with 12 pound test line, which qualified for another World Angling Achievement. 1st Place in the AGLOW Awards for television fishing with a show about fishing with mulberries. June 21st a personal record of 3 state award bass was caught on a single day, using a black/blue Stanley casting jig with a black Auger Frog trailer. Photos of each of these bass made covers of magazines (Midwest Outdoors and Fishing Facts), a TTI Hooks catalog cover, and one is the official photo used in the Hall of Fame for the 2012 induction as Legendary Angler. Started work for the Scott County Iowa Conservation Department in seasonal park/forestry maintenance. 1st Place in the AGLOW Awards for radio fishing and 3rd place for radio hunting. The passing of Virgil Ward brought out The World of Virgil Ward documentary for another period of airing on PBS stations. Applied for Dan’s Fish ‘N’ Tales trademark. Appointed to the Gene Larew Tackle Pro Staff. Worked on the Rock Island Conservation Club rules committee to establish new rules and regulations for the Club’s lakes, in order to promote a lunker bass fishery, and improve all around fishing. Elected to the Rock Island Conservation Club board of directors. Aired The World of Virgil Ward, a PBS TV documentary. Wrote for Bassing America during this year. Wrote assigned articles for Angler Sport. Started production on The World of Virgil Ward, a PBS TV documentary. Illinois Sports Outdoors, now Adventure Sports Outdoors, started carrying the Dan’s Fish ‘N’ Tales column. XPoint and Tru Turn Hooks. Started Team Fish ‘N’ Tales as a seminar trio with Johnnie Crain and Don Banning. Wrote for Outdoor Guide during this year. Wrote for Tennessee Valley Outdoors during this year, but the articles are still appearing on their web site. Wrote for Quad City Sport Connection during this year. Began entering outdoor media competition for writing, radio and television. The first annual Dan’s Fish ‘N’ Tales Casting Contest, which now takes place every August during the Rock Island Conservation Club’s “Open to the Public” Picnic. Started writing for Southeast Iowa Outdoors, now Big River Outdoors. Wrote for On Deck boating magazine. Hosted Dan’s Fish ‘N’ Tales bass and ice fishing videos produced by HQ Video. Articles were published in the Illinois/Iowa Fish & Game Finder. Hosted the Dan’s Fishing Tips series on WQAD sportscast. Participated in the Golf Pro Fishing Day for the Quad City Golf Classic in Moline, IL. Hosted Dan’s Fishing Tips, aired during breaks in TNN and ESPN outdoor programming on Cox Cable. Participated in the Golf Pro Fishing Day for the Hardee’s Golf Classic in Moline, IL, for which golf pro took first place. Started the Dan’s Tourney Tales magazine column in Midwest Outdoors which lasted until 1995. Hosted and produced an instructional video for C&H Products’ Sportsman’s Odor Away Soap. 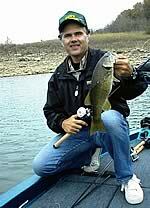 Conducted and competed in first season of Bass Wrangler Tournaments. Placed 5th in the Bass Wranglers’ Year-End Grand Champion race. Appointed to the J.L. Trabue sale representative group’s pro staff (Shimano, Storm Lures, Norman Lures, Humminbird, Owner and Bagley). Started organizing Bass Wranglers, Inc. Guest on Virgil Ward’s Championship Fishing TV Show. Appointed to Tru Turn Pro Staff. First fishing trip with Virgil Ward. Appointed to the Skyline Pro Staff. Midwest Outdoors begins publishing articles under the Dan’s Fish ‘N’ Tales columnhead. LakeRiver Times, in Bull Shoals, AR starts carrying Dan’s Fish ‘N’ Tales. Started writing for Bass News, the publication for the International Bass Association, Southwest Bass Association and Midwest Bass Association. Appointed to the Bill Norman Lures Pro Staff. First newspaper column in the Milan Mirror. Appointed to Team Ryobi, for working with the engineering department on research and development of fishing reels. Started working as a sales representative for Mr. Bass Lures. Born and raised on the shores of Long Island, New York, Brendan Cucinello grew up saltwater fishing with his father Albert, a passionate fisherman. At the age of 16, he became interested in freshwater bass fishing. 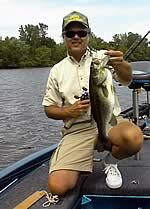 In 1996, he joined the Long Island Bassmasters and started competing in local bass fishing tournaments. 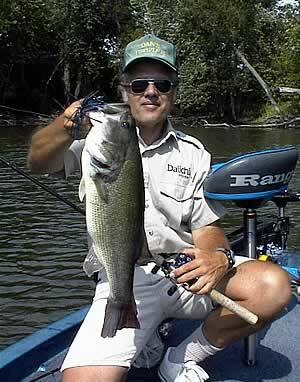 Since then, he has claimed over 70 first place finishes in club and regional open bass fishing tournaments. Beyond his many wins, he holds several local records and countless top ten finishes. On September 13, 2004, the fishing world lost one of its greatest legends, Virgil Ward. He was 93 years old, and fished up until a couple of weeks before his death.